Party Hard has an interesting premise where you play the role of a psycho who simply does not like loud parties. His solution? Kill every one at the party of course! If I was to try an nail Party Hard to a single genre, I would say it's a tactical stealth game, though murder-sim also comes to mind. The idea of putting the stealth genre into a crowded, open room, as Party Hard has done, is a pretty unique experience. 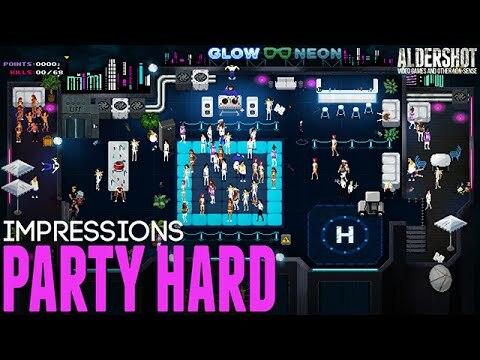 In most other stealth games, the area is sparsely populated with tons of corners and objects to hide around, but in Party Hard you're in a large open room, where every one can see every one else. It makes stealth tactics much more interesting as the player will have to be creative on how he or she approach any given situation., with witnesses littered every where. In Party Hard, the most basic way of accomplishing your goal of murder is simply to stab someone. It's also recommended that you dump the body somewhere unseen as they'll alert other party goers. The key here is not to get caught, even if someone alert the cops, as long as you don't get pined with the crime, you're still good to go. The game also gives you an assortment of randomly generated environmental traps and dangers, with each stage featuring it's own unique RNG generation. You can activate any of these traps at any given moment in order to help you murder the party. The game also encourages creative play, as each scenario plays out more like a sandbox. For example, there is a stage with a swimming pool. I got creative, and experimented with carrying passed out partiers into the pool to see if they'd drown. Indeed they did, and this is just one example of how you can get creative with the many "kill tactics" available to you. The overall premise of this idea, with how sandboxy the stages are designed, coupled with the random event generation that comes with every play though, the game does a good job at encouraging replay, while keeping things interesting and surprising. Though the core of Party Hard is pretty enjoyable, and if nothing else, unique and interesting, it's not without it's faults. Your character's movement speed is at a snail's pace, with only a short, and slow regenerating stamina bar to help with it. It also encourages a lot of moving back and forth repetitively in order to dump bodies safely. Couple these 2 slow elements with the fact that when you fail a stage, you have to start at the beginning. Considering that some of the stages can take upwards to, if not over, 20 minutes to complete, the game can feel tedious at times. Party Hard's overall creative stealth play, with it's interesting random event generation, I found it more enjoyable than tedious. It's overall a very unique and enjoyable experience, though some of the tedium will turn some players off.